Operator and Principal for the available vacancies in Morarji Desai Residential Schools of Minority Welfare Department and Minorities Dept Schools Navodaya of Karnataka State. There are total 147 Lecturers, Principals, Teachers and non teaching Jobs in Morarji Desai Residential Schools and Navodaya Schools. Hyderabad Karnataka Candidates vacancies also separately given below. Currently vacancies are available for all the subjects including languages, lecturer jobs. To apply for this Teachers Jobs in Karnataka Navodaya/Morarji Desai Residential Schools Candidate must have qualified Bachelors Degree with B.Ed or its equivalent. Selection for this Residential Schools Teachers Jobs will be based on written examination only. 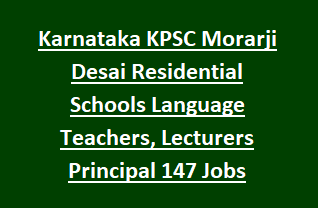 Complete details regarding KPSC Morarji Desai Residential School Teachers vacancies recruitment qualification details, pay scale, age limits and more data is given below. This latest recruitment is only for the Principal and Language Teacher, Lecturer jobs in Morarji Desai Residential Schools. There are total 37 vacancies in this Karnataka Residential Schools Teachers Jobs Recruitment. Candidates must have qualified Bachelors with B.Ed for teachers jobs. For Computer Teachers candidate must have qualified BSc Computers or BCA or MCA or MSc Computers. For Physical Education Teacher B.PEd with Degree. For Subject Teachers candidates must have completed degree in respective subject is one of the main subject and should have qualified B.Ed in same subject or its equivalent. For Lecturer Jobs-PG in respective subject and B.Ed qualification is required. For post wise pay scale refer official notification. Selection for this vacancies will be through written examination only. Objective type written examination will be conducted for 200 Marks and consists to two different papers. Applications will be accepted through online mode only. Submit application form online via kpsc.kar.nic.in. Closing date for application form submission online is 24-03-2018 by 11:45 PM. At the time of online application candidates has to upload latest passport size color photo of scanned copy and Signature image. Please read official notification first before applying online. Karnataka Graduate Primary Teachers Exam Notification 2017: Candidates who are willing to make their career in teaching field, this is the great opportunity to utilize this chance. Government of Karnataka has issued notification to recruit Graduate Primary Teachers Jobs. Job Seekers who are desirous for these govt Teachers jobs can apply by filling the application form. Karnataka state Govt has released total 10,000 jobs to fill up Teachers jobs at various Government Schools of Karnataka state. Talented and interested individuals from Karnataka state are invited by the Organization to fill Govt teachers vacancies. Karnataka Govt Selection Board is going to conduct recruitment test to select candidates for Karnataka Graduate Primary Teachers Jobs. Job Hunters with essential eligibility criteria have to submit application forms through online mode before 25-09-2017 using the official website http://www.schooleducation.kar.nic.in/. Applicants possesses Bachelor’s degree in relevant stream and D.Ed/ B. Ed or Teachers eligibility test are eligible to apply for Karnataka Graduate Primary Teachers Recruitment Vacancies. Total no of posts: 10000 posts. Starting date to apply: 26-08-2017. Closing date to apply: 25-09-2017. Individual must possess Bachelor’s Degree in relevant stream/ Subject and D. Ed/ B. Ed or must have passed Teachers Eligibility Test. Check the full information regarding qualification from the official notification. Applicant age should be more than 21 years and upper age limit is 40 years. Age relaxation for reserved candidates will be fixed as per Karnataka Govt rules. Govt of Karnataka education department will conduct written examination and Interview to select candidates for Graduate Primary Teacher Vacancies. Salary per month is Rs. 14,550/- to Rs. 26,700/- as per Karnataka Govt norms and other allowances as per govt norms. Details of Karnataka Graduate Primary Teachers Jobs will be displayed in the Notification. Read the advertisement carefully. Search for application form link and fill the entries of application form for selected post. Upload all the required documents, recent passport size photograph and filed application form before last date. Application process for Karnataka Graduate Primary Teachers Notification starts from 26-08-2017 and closed on 25-09-2017. Take the printout copy of Karnataka Primary Teachers Recruitment application form for future reference. Starting date to apply Karnataka Teachers Jobs: 26-08-2017. Closing date to apply for Karnataka Primary Teachers Jobs: 25-09-2017.